Jamaica is an island nation in the Caribbean, and like all locations in the Caribbean, you will have one of the best vacations ever. There are plenty of attractions, and one of the most popular is the Nine Mile, the place where Bob Marley was born and is now buried. But as you can imagine, the island is the home to stunning beaches and pristine flora and fauna. You can go hiking in the heart of Jamaica, which is the mountains. You can go scuba diving, snorkeling, windsurfing, and jet skiing. One of the most popular attractions in the water is swimming with the dolphins. It is an unforgettable experience that you cannot miss. However, before traveling to Jamaica, you must see whether or not you are required to obtain a visa. Fortunately for the most of you, Jamaica’s visa policy is lenient, and there are 116 countries that are visa exempt. Their citizens can enter Jamaica without a visa, and the stay period varies from 30 days to 6 months, depending on the nationality. 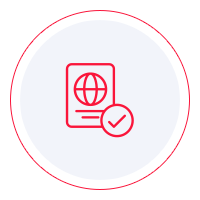 Visas on arrival are also available, but only for a limited number of nationals. The rest of the travelers must obtain a visa from the nearest Jamaican embassy or diplomatic mission. You can easily find out in which category you are. You can look for Jamaica’s visa policy and try to find your country on the lists of visa-exempt states, or you can use iVisa’s Visa Checker. The latter is easier to use. All you must do is select your country of origin from the drag-down menu on the left and put Jamaica as your destination (right box). If you are not required to get a Jamaica visa, you are good to go, but if you do, the Visa Checker gives you a list of embassies that are near you. In some cases, the application can be submitted at a British diplomatic mission. iVisa does not process visa applications for Jamaica because the visa policy makes no mention of electronic visas. If and when that happens, we will be able to provide a short application process. In the meantime, all we can offer is information, which is why our support service is at your disposal 24/7. If you find out that your only option is to go to a Jamaican embassy to get a visa, you need to read about the requirements. You can find a lot of information online, although we recommend that you contact the embassy itself and ask your questions there. The information online is not always the most reliable, and you do not want to waste time going back and forth to the embassy. Nevertheless, what we can tell you is that you need to have a valid passport that does not expire for another 6 months from the date of arrival in Jamaica. For further information, contact the diplomatic mission. We regret that we cannot provide more assistance with the Jamaica visa application process, but we hope that the information above is somewhat helpful. If you have more questions, do not hesitate to contact us.